When nonsmokers are exposed to secondhand smoke it is called involuntary smoking or passive smoking. Nonsmokers exposed to secondhand smoke absorb nicotine and other compounds just as smokers do. The greater the exposure to secondhand smoke, the greater the level of these harmful compounds in your body. Secondhand smoke is classified as a �known human carcinogen� (cancer-causing agent) by the US Environmental Protection Agency (EPA), the US National Toxicology Program, and the International Agency for Research on Cancer (IARC), a branch of the World Health Organization. Secondhand tobacco smoke contains over 4,000 chemical compounds. More than 60 of these are known or suspected to cause cancer. 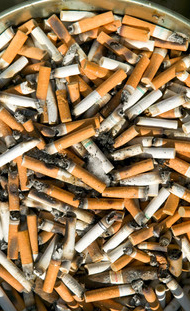 Involuntary smoking causes disease, including lung cancer, in healthy nonsmokers. When compared with the children of nonsmoking parents, children of parents who smoke have more frequent respiratory infections, more respiratory symptoms, and slower development of lung function as the lung matures. Separating smokers and nonsmokers within the same air space may reduce, but does not eliminate, the exposure of nonsmokers to secondhand smoke. Some studies have also suggested that ETS may be linked to an increased risk of breast cancer. The California Environmental Protection Agency recently concluded that ETS causes breast cancer in younger, mainly premenopausal women. The US Surgeon General is currently reviewing the evidence on this link, and a report is expected in late 2006. Your workplace: Secondhand smoke meets the criteria to be classified as a potential cancer-causing agent by the Occupational Safety and Health Administration (OSHA), the federal agency responsible for health and safety regulations in the workplace. The National Institute for Occupational Safety and Health (NIOSH), another federal agency, also recommends that secondhand smoke be considered a potential occupational carcinogen. Because there are no known safe levels, they recommend that exposures to secondhand smoke be reduced to the lowest possible levels. Aside from protecting nonsmokers, workplace smoking restrictions may also encourage smokers who wish to quit or reduce their consumption of tobacco products. Public places: Everyone is vulnerable to secondhand smoke exposure in public places, such as restaurants, shopping centers, public transportation, schools, and daycare centers. Although some businesses are reluctant to ban smoking, there is no credible evidence that going smoke-free is bad for business. Public places where children go are a special area of concern. Your home: Making your home smoke-free is perhaps one of the most important things you can do for the health of your family. Any family member can develop health problems related to secondhand smoke. Children are especially sensitive. Think about it: we spend more time at home than anywhere else. A smoke-free home protects your family, your guests, and even your pets. There is no research in the medical literature about the cancer-causing effects of cigarette odors, but the literature shows that secondhand tobacco smoke can permeate the hair, clothing, and other surfaces. The unknown cancer causing effects would likely be minimal in comparison to direct secondhand smoke exposure, such as living in a household that has a smoker.